Carol Bolton is Programme Director for English at Loughborough University. She has published widely on Romantic-period topics and has particular interests in writings that engage with issues of exploration and empire and in late eighteenth- and early nineteenth-century politics. She has played an important role in rehabilitating and exploring the work of Robert Southey, the subject of her first monograph and the focus of several substantial editorial projects in which she has played major parts. The latest of these, an edition of Robert Southey’s Letters from England by Don Manuel Alvarez Espriella, which we discuss below, was recently released by Routledge as part of the Pickering Masters series. 1) How did you come to realise that you wanted to produce an edition of Letters from England? I have worked on several collaborative projects to publish editions of Southey’s poetry (Poetical Works 1793-1810, 2004; Later Poetical Works 1811-1838, 2012) and letters (The Collected Letters, Parts 1-4, 2009-2013) as well as writing articles, essays and a book (Writing the Empire: Robert Southey and Romantic Colonialism, 2007) on his representations of travel, exploration and colonialism. Letters from England presents a view of his own country through the eyes of an invented foreign national, so we see Southey distancing himself from his fellow citizens to write insightfully and often humorously about them. It is one of his most engaging works and presents a detailed, on-the-spot survey of early nineteenth-century life. The lifetime editions of this book (1807, 1808, 1814) are only available in copyright libraries and the most recent modern edition by Jack Simmons, was published in 1951. In sixty years the field of Romantic Studies has changed immensely and I wanted to present a new critical appraisal of the book, based on recent Southey research, as well as drawing on current methodologies that re-historicise literary works within their social and political context to appreciate their cultural relevance. 2) Your introduction very interestingly contextualises Letters from England within existing traditions of topographical travel writing and of depicting England through the eyes of fictional foreigners. To what extent do you think that Southey’s book-making was imitating past examples, and to what extent do you think that the Letters constitute an innovation? As a bibliophile with a strong sense of literary tradition, Southey saw himself in a long line of authors, poets and historians in his own book-making ventures. In Letters from England he drew on the eighteenth-century interest in travelogues – domestic and foreign, factual and fictional – to produce what he hoped would be a lucrative best-seller. Writing it in the epistolary form, at a time when private reflections marketed for public consumption were popular, and employing a wry tone that is often satirical, the reflections of his Spanish tourist were intended to entertain. In this way he employed techniques used by earlier writers, such as Montesquieu, Horace Walpole, Thomas Percy and Oliver Goldsmith. Despite sharing some of the apprehensions of these previous authors – who highlight declining moral standards and increasing materialism in the English people – Southey raises other grave issues about his contemporary society. His fears for the stability of the nation, its eroding religious values, and his Romantic, anti-industrialist views on increasing mechanisation, urbanisation, consumerism, and progress for its own sake rather than to improve human lives, are all concerns in this work. In order to criticise the present, he judges his countrymen with a historian’s eye. His sense of Englishness is rooted in the past, its cultural traditions and heritage, and he invokes an idealised, nostalgic version of feudalism, which in spite of its hierarchical structure he believed had respect for all members of society. Southey felt his travel account was innovative in the ‘life-painting’ it provided, and Espriella doesn’t just visit obvious places, such as abbeys, tombs and national monuments. He describes everyday life on the London streets and in the factories of the manufacturing towns. He comments on the wealth and majesty of such a prosperous nation as well as capturing vignettes of poverty and suffering to produce a broad survey of early nineteenth-century England. 3) What seem to you to be the best and worst aspects of England in Espriella’s (and Southey’s) eyes? The best aspects of England are its cultural heritage and the historical sites of interest that a tourist like Espriella would be expected to visit: cathedrals, abbeys, great houses, palaces and monuments. But Southey is concerned that while foreign visitors appreciate these places, his own countrymen do not value the rich heritage in front of their eyes. The English people are often shown as having valuable qualities of character – for instance their sense of intellectual and political independence – but Southey also sees them as being unaware of their place within a national tradition and a more glorious past, as well as lacking a cohesive social bond between the classes. In his anti-modern stance, he presents the English as focused on their livelihoods, so that the goods they produce and consume are more highly prized than their fellow citizens. His Romantic, anti-economic perspective paints a picture of soulless materialism that drives industry, hardens hearts against the poor and impoverishes English culture and heritage. Despite criticising his Spaniard’s ‘superstitious’ Roman Catholic faith, he employs his firm belief in the merits of a strong national church to expose the empty ceremonies and lip-serving, cold-hearted religion of the English. He also provides a survey of the sects that are springing up, whose charismatic prophets and zealous congregations are attracting members to what he considers insane beliefs and behaviour. Through Espriella, Southey warns that the schismatic state of the English religion is a threat to the Anglican Church as well as national stability. And Southey also uses the scandalised sensibilities of his outsider to lever a more concerned response from his countrymen towards the labouring classes and soften the hearts of the wealthy in their attitudes to the poor. As might be expected from a member of the ‘Lake poets’, Southey shows prescience in anticipating our modern ecological concerns, by demonstrating how enclosure and industrialisation are diminishing the countryside as a natural resource. The pedestrian tour of the Lake District made by Espriella shows his appreciation of its wild ruggedness at a time when theories of the sublime were popular, and the region was beginning to attract tourists (a word coined during this period). In prioritising the subjective, experiential voice of the walker, Southey shows how he and his fellow Romantics have become identified with this emblematic region and how their aesthetic responses to it have endured in England’s cultural heritage. 4) Now that the edition’s available, how do you think that scholars might profitably employ the insights to be gleaned from Letters from England? Are there aspects or elements which you think might be particularly useful for teaching the Romantic period at undergraduate or MA level? The book is a rich source of information on the social history of the early nineteenth century. In addition, the editorial apparatus explains topical references, literary and cultural allusions, and includes translations of foreign language material. It provides references to Southey’s correspondence, facilitating greater understanding of the text, the influence of Southey’s friends and correspondents on its composition, and accurately identifies the sources he drew on in writing it. The fact that sections of Letters from England have been frequently cited and anthologised demonstrates its utility as a resource for the period. This new scholarly edition enables a full understanding of its socio-historical context, authorial intentions, and the relationship between this text and other works by Southey and his contemporaries. It intends to assist in the current trend for reappraising Southey’s eminence as a literary figure and to highlight the limitations of categories such as poet, historian or journalist that have been previously applied to him. Although Southey was a prolific and proficient writer in all these fields, we now know that he was also an amusing prose writer. Southey’s centrality to Romantic-period literature and its textual and cultural practices is now evident, but this edition adds an extra dimension in showing how the established perceptions of genre and style within which he and his contemporaries worked were challenged in a debate over form and function that makes this one of his most innovative works. There are several aspects of the text that are useful for teaching the Romantic period to students. I have found the visitor’s view of London and his responses to the metropolis very helpful in teaching my MA module ‘Literary Londons’. The Lake District sections explicate contemporary aesthetic theories of the picturesque and sublime. The intertextuality of the book, identified in my research into Southey’s correspondence, identifies a range of correspondents and sources that illuminate the ‘bookmaking’ activities of nineteenth-century authors. In addition, the bifocal perspective of the experienced English author and the naive Spanish tourist are ideal for teaching students on courses about narratology, its structures and functions and use of focalisation. 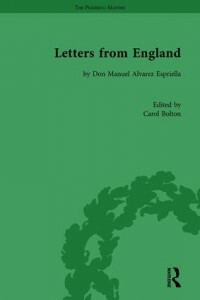 Letters from England is an essential source for the historical context of the period, against which many canonical and lesser-known texts can be read. This will facilitate greater understanding of the social, political and religious background of the Romantic period, and illuminate the attitudes, beliefs and concerns of its authors and their characters. 5) What new projects do you plan to work on now that the edition is complete? I intend to investigate some of the contemporary issues raised by Southey in Letters from England in greater depth in the form of articles and essays. For instance, I am very interested in the version of ‘Englishness’ he presents to the reader and how this is informed by his views on history, literature and cultural precedents. I also intend to explicate his Romantic engagement with landscape (domestic and alien) in this book and his poetry, to demonstrate how his responses to colonialist ventures originate from his Anglophile sense of historical tradition and the influences of pastoral poetry. In the longer term I will be working on a monograph that examines the ‘politics of place’ in attitudes to travel, exploration and colonialism in the Romantic period.